Every Kashmiri Pandit wants to visit Sharda, near Muzaffarabad, and pay obeisance at the ancient seat of learning. Srinagar: Kashmiri Pandits have stepped up the effort to realise a “long-cherished dream” and are hopeful that the present dispensation at the Centre will not disappoint them. They want reopening of Sharda Peeth, a revered place of Kashmiri Hindus in Pakistan-occupied-Kashmir (PoK), for pilgrims from Jammu and Kashmir and beyond. A delegation of Kashmiri Pandits' representatives associated with a pressure group called “Save Sharda Committee Kashmir” (SSCK) recently met minister of state for social justice and empowerment Vijay Sampla in New Delhi to plead their case and received “positive response” from him. “We presented a memorandum for reopening of pilgrimage to Sharda Peeth on the lines of Sikh pilgrimage to Nankana Sahib in Pakistani Punjab,” said Ravinder Pandits, a founder-member. Sharda is about 150 km from Muzaffarabad, the capital of PoK, and is a breath-taking green spot at an altitude of 1,981 meters. Shardi and Nardi are actually the two mountain peaks overlooking the valley, named after legendary princesses Sharda and Narda. It has a captivating landscape with numerous springs and hillsides covered with thick forest. Over the right-bank, opposite to Sharda, the river Neelam (known as Kishan Ganga on the Indian side of the LoC) is joined by the Surgan mountain stream along which a track leads to the Noori Nar Pass and through it to Kaghan valley. In Sharda, the ruins of an old Buddhist monastery and a fort are located. It was also an important learning seat of Kashmiri Hindu and the old script of Kashmiri language Sharda has derived its name from the place having the historical background. The committee demanded that the pilgrimage should be allowed for Hindus from Jammu and Kashmir on cross-LoC permit which, at present, is valid for the divided Kashmiri families and for trade between the two sides only. The faith in Sharda Peeth is such deep in Kashmiri Pandits that some time ago the SSCK sent flowers to be laid at the ancient site and got the soil from there through a visiting group of civil society members. “Later, we got a photo of Sharda Mai installed at the temple,” he said. An FM radio launched by the community in 2011 was also named as “Radio Sharda 90.4 FM”. 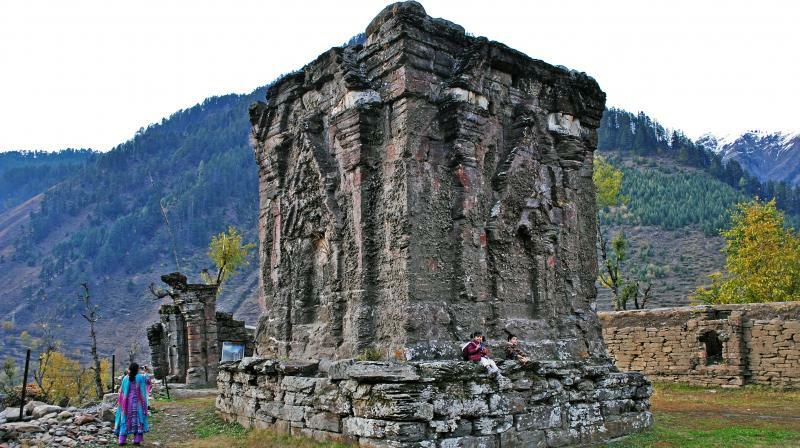 The Pandits were also planning to install a replica of Sharda Peeth in Srinagar. The last yatra to Sharda Peeth was undertaken in 1947, shortly before the Tribal militia raided Jammu and Kashmir and the first war on the ownership of the scenic state broke out between newly-created Pakistan and India. It was led by renewed saint from Kashmir Swami Nand Lal. “We want an amendment in cross-LoC travel permit rules to enable non-Muslims also to go to PoK,” Pandita said. “The committee is planning to meet Prime Minister Narendra Modi also to plea our case before him. The other Kashmiri Pandit outfit which has been vigorously pursuing the plea is All-Pandit Migrants’ Coordination Committee (APMCC),” he added. A delegation of the APMCC last year met chief minister Mehbooba Mufti to push for reopening of Sharda Peeth for pilgrims from Jammu and Kashmir.